Time enroute in the morning to explore Chepstow. Chepstow, which means marketplace in Old English, offers relaxed, niche shopping in arty surroundings. Lined with handsome Georgian and Victorian buildings, the heart of town was made even more appealing in the mid-2000s. An award-winning scheme added pedestrian areas and intriguing stone walls and sculptures, inspired by local lore. The Normans knew a spot worth defending when they saw one. Their castle on the River Wye, two miles from its mouth, was a massive show of strength and is probably the first medieval stone built castle in Britain. Chepstows Great Tower Keep was commissioned by William the Conqueror barely a year after the Battle of Hastings, making this Britains oldest surviving post-Roman stone castle. 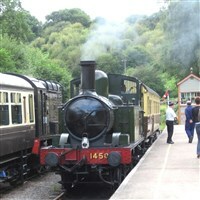 Then on to the Forest of Dean Railway. With 4.5 miles of line running through beautiful woodland and countryside offering visitors a chance to experience the relaxing pace of a typical country branch line. During your return trip you will be served a cream tea on board. You can even add a little extra sparkle with a miniature bottle of Prosecco (20cl, 10.5% Vol, age 18+ only) for only £5 more (served with a champagne flute).